Over the Labor Day holiday, so called “moderates” (confused if they are neocons or liberals) threw around the name Hillary Clinton. Considering the dismal performance of Barry Obama, these folks believe the Dem side of the One Sided Party should run Hil for command-in-chief teleprompter reader. I kid you not. This is how deluded some people are. The con game works like a charm. Thanks to a few months of Barry the Bumbler — it’s all in the script — she is ready to swallow the Clinton jive hook, line and sinker. There ain’t a lick of difference between Hillary and Barry. Both are globalist tools. Both are here to fool you into thinking that it means something when you go into a computer hacked polling place and cast your ballot. Same thing for intra-party squabbles. The electorate is mostly putty in the hands of the globalists. Obama’s a failure, so Dems should get Hillary in there. It’s all musical chair for our rulers. 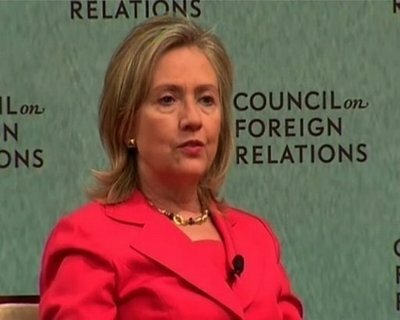 Speaking of globalists, Hil ventured over to her one of her favorite haunts the other day, right down the street from the State Department, the offices of the Council On Foreign Relations. She talked up world government and the United Nations. Lately the UN has taken on new importance in the minds of the elite. It is in the process of getting a new spit shine. Expect to hear more about it in the weeks ahead.